Cardiff-by-the-Sea, usually referred to as Cardiff, is a beach community located in Encinitas in San Diego County, California. 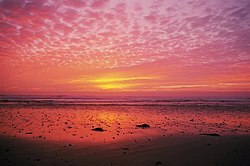 The Pacific Ocean is to the west of Cardiff, the rest of Encinitas on its east and north, and a beach and lagoon on its south. With a population of under 12,000, Cardiff-by-the-Sea operates as part of the city of Encinitas, but unlike the other communities that comprise Encinitas, has its own ZIP code (92007). Cardiff is also home to a few well-known surf spots, such as Swami's and Cardiff Reef. In 1911 this former farming community began to develop when Boston developer J. Frank Cullen broke ground to build new homes. Frank Cullen's wife, a native of Cardiff, persuaded him to name the community "Cardiff", as well as many streets, such as "Birmingham", "Oxford", "Chesterfield" and "Manchester", despite heavy Spanish influence in the area. In 1986, "Cardiff" joined with the nearby communities of Leucadia, Olivenhain, and Encinitas to form the incorporated city of Encinitas. Cardiff is part of the city of Encinitas, which is governed by a five-member city council, elected at-large to staggered four-year terms at two-year intervals. In the California State Legislature, Cardiff is in the 36th Senate District, represented by Republican Patricia Bates, and in the 76th Assembly District, represented by Democrat Tasha Boerner Horvath. In the United States House of Representatives, Cardiff is in California's 49th congressional district, represented by Democrat Mike Levin. Stand-Up Paddle surfers at Cardiff Reef in Encinitas, California. Bob Haro, former freestyle BMX rider turned artist and business executive. He is the founder of Haro Bikes and was one of the most important early innovators of BMX freestyle. Kendra Scruggs, daughter of Baxter. ^ "Cardiff-by-the-Sea". Geographic Names Information System. United States Geological Survey. Retrieved 2009-02-04. ^ Tucker, Wehtahnah; Bujkovsky, Gus. Cardiff-by-the-Sea. Arcadia Publishing SC. pp. 7, 15. ISBN 9780738569512. ^ Andreen, Mike (August 16, 2011). "Tale of Incorporation: How Encinitas Became an Entity Onto Itself 25 Years Ago". Encinitas Patch. Retrieved 29 July 2018. ^ "Cardiff School District". Archived from the original on April 24, 2010. Retrieved May 20, 2010. ^ "10 Best Surf Spots in San Diego". Retrieved May 22, 2012. ^ "IRONMAN TRIATHLON : Mark Allen Wins, Gains Confidence". Los Angeles Times. Associated Press. October 8, 1990. Retrieved May 24, 2011. CardiffByTheSea.org - Information center and chamber of commerce. This page was last edited on 1 April 2019, at 21:35 (UTC).